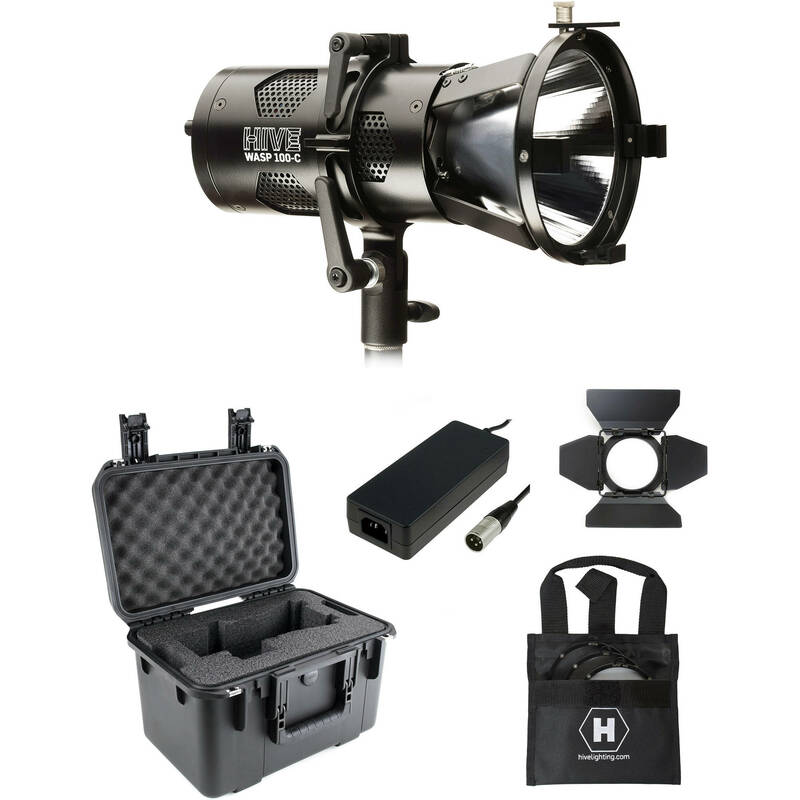 The Wasp 100-C LED Spot Light Kit with Stand and Custom Foam Case from Hive is a lightweight, versatile light source with a small form factor. The kit comes with a stand, case, Wasp 100-C LED Head with 22° reflector, Medium, Wide, and Super-Wide lenses, as well as a set of 4-way barndoors. Hive uses S.H.O.T controls that ensure complete control and adjustment of every aspect of light output. It uses five-LED chip blending and red, amber, lime, cyan, and sapphire colors with a high CRI/TLCI rating of 98 and 97. Color can be adjusted from a very warm amber 1650K to an icy blue 8000K. There's a 360° hue adjustment around the color wheel as well as 0-100% saturation control. The 100-C can also be dimmed from 0-100%. While you can make all of these adjustments manually, you can also make them remotely via your smartphone or onboard DMX.